MIA Energy (Pvt) Ltd. is a business unit working in the diversified portfolio of MIA Corporation (Pvt) Ltd. We offer Diesel Generators ranging from 13 KVA to 3000 KVA. Being sole distributors of Khonaysser Motors, we offer DG sets having VOLVO PENTA, PERKINS and CUMMINS engines, coupled with STAMFORD (UK) alternators and control modules of DEEP SEA (UK). We also offer Switchgears, Light Towers LV/HV panels and Transformers. Khonaysser Motors is a Lebanese multinational company (established 1960) and serving the market for diesel engines and trucks. Exclusive agent for VOLVO PENTA in Lebanon. Official distributor for Stamford (UK) & contract signed with Cummins Generator Technology (CGT). 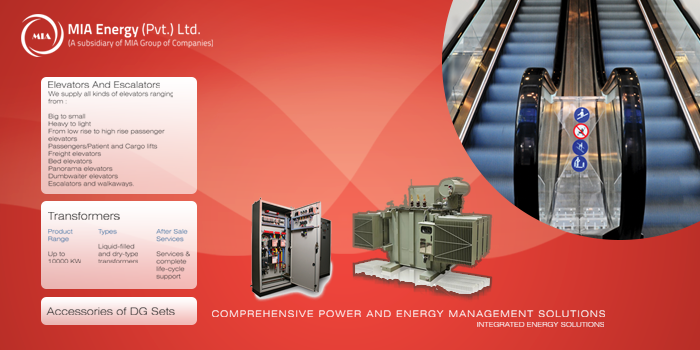 Presence in Lebanon, Qatar & Iraq, and supply gensets for Middle East, Africa, Central Asia and Europe. Product range starting from 13 KVA to 10,000 KVA. Canopies, switch gears, sync panels. Genuine spare parts and International After-Sales Support. More than 2500 units in stock. Ranging from 85KVA to 630KVA. 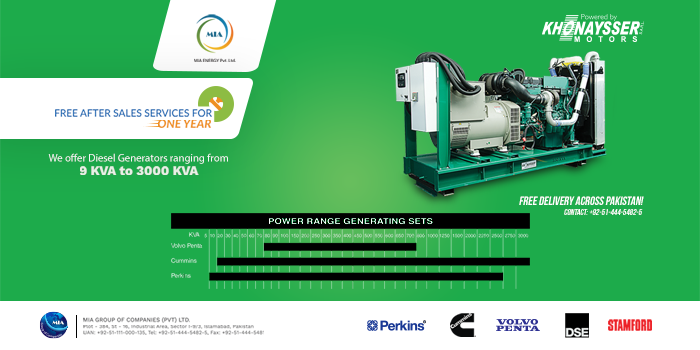 Ranging from 13KVA to 100KVA and 750KVA to 2250KVA. Ranging from 750KVA to 3000KVA. Overhauling kits for entire range of PERKINS & VOLVO PENTA are also available. Customized operator trainings for customers at our facility & customer premises.